DNA Bass Guitars feature our patented pending proprietary 5 point contact in-set bridge, our exceptionally tight neck & bridge to body fastening system & optional custom designed wiring harnesses for the ultimate Bass Guitar electronic control. 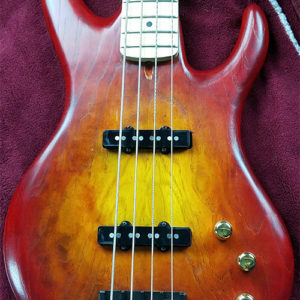 Playability – It is comfortable and plays easier than most basses. Body size – it is the most comfortable bass to play and the 7 lbs weight makes it easy to manage in a 4 set gig. 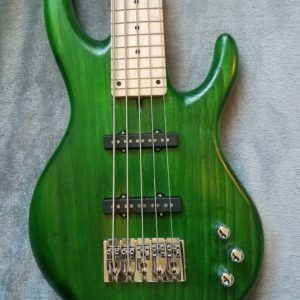 Sustain – The bass sustains longer than most other basses allowing the player to play smooth and not having to muscle the instrument. Versatility in tone – It can sound as big and fat as you need and you get a myriad of tones virtually enabling it to kill in any style of music and create any bass tone desired by the bass player, band leader, or producer. Great studio instrument – NO noise, strong clean signal and it’s highly versatile. 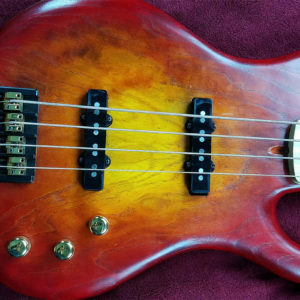 Meet the DNA Accelerator Bass Guitar one of the most advanced state-of-the-art Bass Guitars on the market today. Our technology & craftsmanship work together to create an easy to play velvety fast neck, smooth as silk frets & a deep, rich, clear tone, all in a perfectly balanced instrument. DNA Bass Guitars are hand built in the foothills of the Sierra Mountains with old school craftsmanship & quality, engineered with twenty first century technology to maximize your playability, tone, comfort & balance. 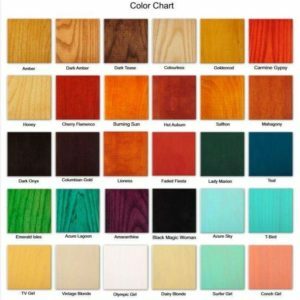 We hand select only the best tone woods available. As a ‘Green Company’ we do not use any spray materials such as polyurethane and polyester paints. At DNA Guitar Company we apply hand rubbed water based dyes, specially formulated hand rubbed oil finishes and finally we hand apply a specially formulated hardening wax to complete our finishes. DNA Bass Guitars are handcrafted here in America using only the highest quality American made parts available. Custom hand wound Callahan pickups, HipShot tuners & solid brass bridge, Dunlop Super Bright strings designed by Marcus Miller, and Merlin 5 knobs.